Rated 5 out of 5 by mentat from Silent, sharp and shiny! I got it from black friday sale and so happy with it so far. After using series 7 for a while, this is really a nice upgrade. Much more silent than 7 and smooth shaver. Rated 5 out of 5 by Mike from Brilliant By far the best shaver I have ever tried. Glides so smoothly over the skin. Rated 5 out of 5 by Cromco from Powerful and Close I asked for this shaver for my birthday from my generous kids and just love it. Best electric shaver I have ever used. Can’t recommend it highly enough. Do yourself a favour - go out and get one!! Rated 5 out of 5 by Kipp from Top of the range. As I had owned an Electric Shaver of the same brand I was interested to upgrade to a better model. This one had it all plus it was on a special offer just before Christmas. Rated 5 out of 5 by Kipp from I was impressed that it cleaned itself I bought a basic Braun Electric shaver many years ago from the Shaver Shop and it is still going. So as an upgrade to what I had got I wanted to treat myself to a newer model. The series 9 wet and dry was a little expensive but on a special offer when I looked online so it turned out to be my Christmas treat to myself. Rated 5 out of 5 by Jadem from Best shave Bought this for my partner after checking a few other brands and went with this one and couldn’t be happier. Rated 5 out of 5 by Liz11 from Excellent I bought this for my partner and he absolutely loves it, easy to use and gives him a clean shave. Rated 5 out of 5 by Carole from Great shave... I bought this 2 weeks ago for my husband, and he loves it! Rated 5 out of 5 by Liseyloo from Loved it! I purchased this shaver for my partner. He loves it. He shaves in half the time and his face is so smooth. Rated 5 out of 5 by Busta6063 from Great Shaver I purchased this shaver a few weeks back and it is fantastic. I had been using an electric shaver which is now over 30yrs old (still working but not great). This shaver is in a whole different world compared to it. It is easy to operate, easy to clean and leaves my face smooth and with no irritation. Absolutely pleased I made the decision to buy this one. Rated 5 out of 5 by Uncle Bob from A great shaver I've been using this shaver for a few weeks and I'm very pleased with the purchase. The vibrating heads reduces shaver burn and makes for a very comfortable and close shave. I also love the clean and charge station which means the post-shave task is a breeze. Rated 5 out of 5 by Leyley82 from Excellent Shaver ! Bought this for my boyfriend and he absolutely loves it ! Gives a nice smooth clean shave. Rated 5 out of 5 by Yuting Zhang from Best Electric Shaver ever I've been using Braun shaver for quite a few years and this Series 9 is the best electric shaver I've ever used. The shaver is light in weight and powerful on shaving. My skin feels comfortable aftershave and no additional cream is needed. The Clean & Charge station keeps the shaver clean. Rated 5 out of 5 by Raman from Worth it!!!!! I've been using Series 5 for a few years. Updated recently to this beast and more than satisfied. Rated 5 out of 5 by Gosmo from Smoothest shave ever I purchased this Braun shaver via a on line only limited time sale. It was clearly more expensive that the Panasonic that I had been using for the past 4 years. I am pleased to report that this series 9 Braun shaver is by far and away the best electric shaver that I have ever used. Well worth the money. Rated 5 out of 5 by Nick from Braun series 9 I bought this just recently and is works like a gem. Reliable quiet and quick to clean using the cleaning station. Definitely recommended if your looking for a long lasting and efficient electric shaver. Easy on the skin. Rated 5 out of 5 by macca from Faultless I've been using the Series 9 for 2 weeks having used blades beforehand. The initial cut was pretty coarse as I've read occurs and then has gradually improved to the point where it is now as good as the blade and takes half the time to achieve. The motor is quiet and the shape is comfortable in hand. The cutter for the sideburn is effective. Very happy with the results. Rated 5 out of 5 by JoeN from Superb razor!! Best razor I have owned and I have had quite a few!! Rated 5 out of 5 by Johnny from Great Product Love this shaver. Had a Philips prior to this purchase, although this was good, I find the Braun to give me a much smoother shave and better to handle. Definitely recommend ! Rated 5 out of 5 by Master from Great features and easy to use. I've been using Braun al my life and this is my best shaver yet. Rated 5 out of 5 by Udune from Nice results After other styles of shavers, I decided to try the foil type again. Oh wow, I will not be going back. Very light shaver, which is great for travel with long battery life. The shave results are fantastic. I am usually prone to razor burn, but not with this, very comfortable during and after shaving. The cleaning/charge dock is also a nice feature. 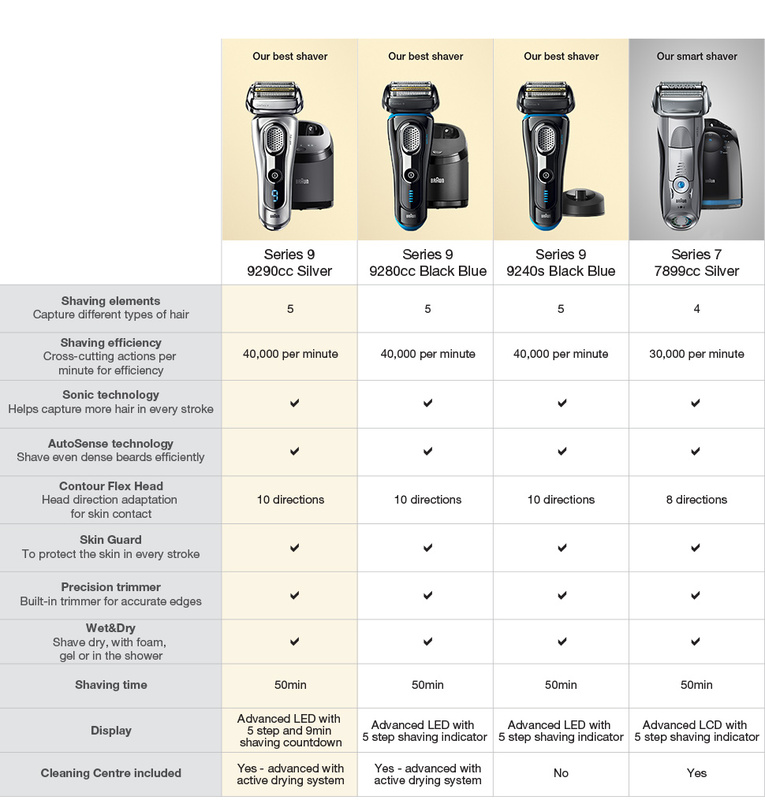 What is difference between Braun shaver models 9280cc and 9290cc ? how does it work on people who like ro be clean shaved? does it cleanzhave like when we do with a normal razor? I've found the shave to be comparable to a normal razor - ie very good. The only differences are no potential for cuts, burns etc, and I've found it easier on the skin. There's a bit of noise with the shave, but not as bad as some electric razors. My only caveat is that I have had issues - the head cassettes didn't last terribly long for me (maybe 6 months max, even though I was told they should last 12), and I've had the unit itself replaced twice. Both times there haven't been questions on the exchange - but it's still a hassle to go back. It's a relatively expensive option, but potentially worth it if you're using it every day and you don't have the same issues I've had with the unit and the cassettes. Is this a cordless (rechargeable) shaver? The shaver is cordless (rechargeable). It sits in a charging station for daily use and has a cord for charging when going away. I just returned from 6 week trip, shaving a couple of times a week and the battery lasted fine without needing to recharge. Hi, yes mainly for a clean shave, hence why I purchase the model &amp; it is great!! Is this silver made in German? What is the difference between 9290cc and 9280cc besides the color being different? There is a price difference of $100 so must be something. Also, few weeks ago I saw 9290cc was on specials at $399. Is that special over?